Are you working with a trusted advisor…or a salesperson? When you partner with someone to help manage your financials, you want to ensure that he or she is truly a trusted financial advisor with only your interests and goals in mind, not just a salesperson looking to make a commission. Below are the 5 main differences between a trusted advisor and a salesperson. 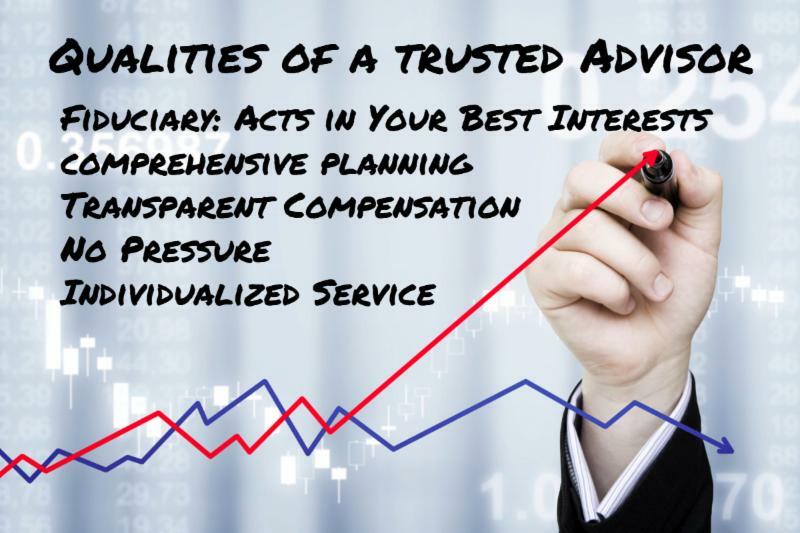 A trusted advisor is a fiduciary and always acts in your best interest. They won’t be talked into selling you a product even if you insist. A salesperson follows the suitability standard and may push you a preferred product that gives them a higher commission. The definition of what it means to act as a fiduciary is very simple: he or she always act in the best interests of their clients. This is in comparison to a salesperson who only needs to check the suitability of a prospective buyer, which is based primarily upon financial objectives, current income level and age, to complete a commissionable sale of a financial product. In a way, when a salesperson checks the suitability of a potential buyer, they are measuring how much financial product can be sold, not the needs of the investor. Two financial advisors, Mr. Fiduciary and Mr. Suitability, are both working with the same client and determine that it would be beneficial to add a Balanced Mutual Fund to the client’s portfolio. A Balanced Mutual Fund is a common type of fund that usually has an equal mix of stocks and bonds. All of the major fund families (Vanguard, Fidelity, T. Rowe Price, American Funds, Franklin Templeton, etc.) offer their own version of a Balanced Fund. Mr. Fiduciary researches all of the available balanced funds and based on fees and expenses, performance, independent ratings, and how the fund is allocated picks the best one for his client. The company that Mr. Suitability works for has an agreement with Mutual Fund Company XYZ. They offer a free trip to Hawaii for any financial advisor that meets a quota and sells XYZ’s Mutual fund to ten of their clients. It’s easy to guess which Balanced Fund Mr. Suitability recommends, right? While there is a chance that XYZ’s Balanced fund is a good one, it is not very likely. After all, Mutual Fund Company XYZ is going to have to pay for many Salespeople’s trips to Hawaii and in order to pay for those trips, most likely their Balanced Fund is going to charge higher fees and expenses while providing less of a return to investors. A trusted advisor does not stop at money management but incorporates all areas of your finances while following a process to help you create a comprehensive financial plan that meets all of your goals. A salesperson has a technique for making a sale and placing a trade. Clients want and need more than just investment management – they want comprehensive financial planning. Clients need an advisor who can act as their financial quarterback by helping them to understand their retirement plans and estate planning needs and coordinate with their legal and tax professionals. Here is a list of financial planning topics that you should be focusing on to secure your Financial Future. A trusted advisor is upfront and transparent about all fees and expenses you will pay for their services and recommendations. A salesperson likes to bury the fees and expenses in reams of paperwork hoping that you never realize they’re there. There are different ways that advisors could be compensated for their services but they should always be upfront, transparent, and detailed with those fees. If an advisor receives a commission when selling you a product, or tells you that there are no fees for what they do, then you are probably working with a salesperson. Many clients think the financial advice they receive is free. I know of a large Wall Street company whose CEO once said, “The sole objective of our firm is to make money.” With those marching orders why would that company and other firms like it do anything for free? Some clients I work with were under the assumption that they were not paying any fees while with their previous financial advisor. When I showed them the fees they were actually paying, they were truly floored and astonished. While on the topic of free advice, it’s usually not good or well-informed. You may have a colleague or family member giving you advice on what to do with your finances; like a hot stock tip or a way to pay less taxes. While intentions are usually good, the advice usually is not. You should never feel pressured when working with a trusted advisor. A salesperson often resorts to high-pressure tactics to get you to purchase something. Occasionally, after doing an analysis on a new client’s financial situation and making recommendations to reach the goals set, I may hear nothing back. As much as a trusted advisor wants to inspire a new client to take action, they will never pressure them into doing it. Still, there are many salespeople acting as advisors that use high-pressure tactics to close a sale. I’m sure at one point or another you have felt the squeeze of a salesperson and it does not feel good. Using manipulative talk, making outrageous promises, and inflating past performance are all typical tactics used by salespeople. Don’t fall victim to these schemes. A trusted advisor should provide a high level of personal attention and involve appropriate advice and service based on each client’s individual situation. A salesperson utilizes a general cookie cutter plan or product meant for a clear majority of clients. Just like every person is unique, no two clients and financial situations are alike. While a Roth IRA may be the best option for one person to save for retirement it may not make sense for another person. A particular stock or bond may not be right for everyone. In addition to the top 5 differences above to ensure you are working with a trusted advisor, below is a checklist to follow. If you were referred to the advisor, was the recommendation strong? Does the advisor seem thorough and detail oriented? Does the advisor take care in reviewing and calculating financial figures? Is your advisor reliable? Do they do what they say they will? Is the response to your financial details non-judgemental? Does the advisor listen well and ask relevant follow-up questions? Does there seem to be a “fit” between you and the advisor? The best-trusted advisor will be with you for the long haul so you should also feel comfortable reaching out at any time with any questions. He or she will continue to touch base with you as you implement your financial plan, monitoring your progress to ensure you are progressing steadily to your goals while removing doubt along the way. Please feel free to schedule a complimentary call with Bautis Financial.